If you used Eudora for a decade and a half, you no doubt have a healthy list of contacts in it by now. Because Eudora is no longer under development, it may be time to switch to a new email client. Eudora holds a trove of information about your contacts. In order to transfer all the names, phone numbers, and email addresses to a different email program, you need to save your Eudora contacts to a Comma Separated Values (CSV) file. Most email, calendar, and address book or contacts software can import contacts from a CSV file. 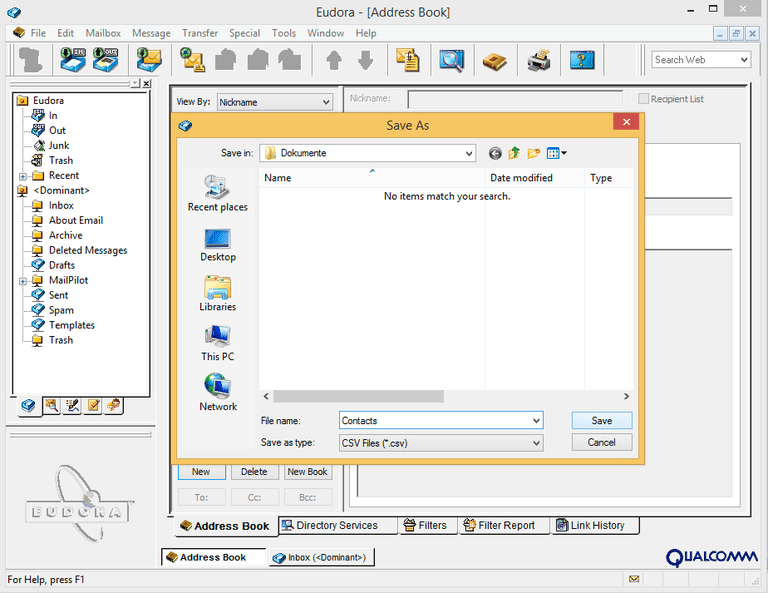 Open Eudora and select Tools > Address Book from the menu. Make sure CSV Files (*.csv) is selected under File type. Type Contacts under File name. Click Save to generate a file with a .csv extension. Try importing the Contacts.csv file into your new email program or service right away. If the email client uses a linked contacts or address book, you may need to import the file there rather than in the email software itself. Each provider varies, but look for an Import setting. When you find it, choose the Contacts.csv file. If the import fails, you may need to do some cleanup. Open the Contacts.csv file in a spreadsheet program such as Excel, Numbers, or OpenOffice.